There were 15 Clark's Bread cards that ended on eBay last Friday night. I didn't know about this subset until I saw the listings and then did some research. 1) How rare are these cards? 2) How desirable are these cards, as in, are there many people who know, care and collect these or are they just a red-headed step child that few know or care about? 3) Were the prices high, low or just about right for them? 1) The cards are very rare. 2) The rarity of the cards make them unknown to most collectors and that does affect the value of the cards. 3) With their rarity and the few people who know about them it comes down to in the auction the old saying "whatever the market will bear." I would say the prices were fair given the condition of the cards. 1) I believe the ones auctioned off last week account for about 50% of all examples. 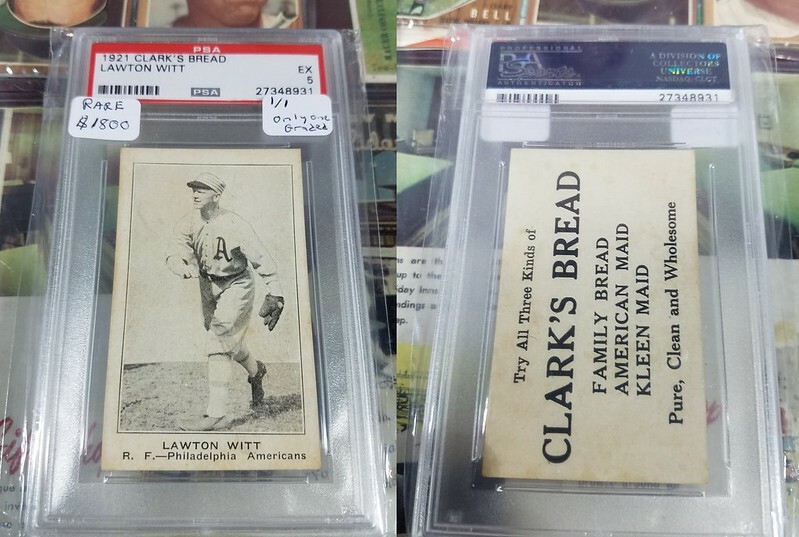 That is, there are about 30 Clark's Bread cards in circulation in the hobby. 2) They're about as well known as most cards of comparable rarity. Haffner's and Gassler's backs (also found with E121 fronts) are in the same boat. Clark's would have been considered rarer than those others a couple of weeks ago, but the Sinclair Park find changed that. Pre-war type card collectors are quite familiar with them. The other 7.6 billion or so people don't really care. 3) There were some eBay network/sniping problems for the first four that sold, so those prices were artificially low. The others finished about where I expected them to. Like Glenn said, they are really tough types. My initial snipe did not go through due to an unspecified "ebay error," and the first few went quite low. I had to readjust and go much higher on my other target, which I got. Same thing happened to me in regards to the Ebay Error, I had a very hefty snipe on a few of the first ones and they went very cheaply. Last edited by Leon; 11-09-2017 at 10:21 AM. This caught my eye at a show today...I don't collect them, but remembered this recent thread and thought it was interesting that one just popped up randomly today (and especially in such nice condition). It was "in the wild" just a couple weeks ago until it was pulled out of a storage shed and sold to a dealer. Always neat to think about what's still out there. Not 100% sure it is the same card Dan, but I think I saw that card at this year's National too. You may have, I was probably off with my timeline. The dealer just mentioned he had bought it from the previous owner recently. A neat card nonetheless. Last edited by Bliggity; 12-08-2017 at 07:56 PM. Plus,I think all the Clarks in that group had pencil marks on the back. Not all of them. This was one that I won. But the real reason I'm resurrecting this thread is to ask if anyone knows about the Clark's Bread bakery itself -- location, years of operation, etc. Does this suggest that Clark's and Holsum (of D327 fame) were the same (New Orleans-based) company? Or is it that "Holsum" and/or "Kleen Maid" were commonly used names for American bakeries to use in marketing their bread in the 20s and 30s? Last edited by Leon; 02-09-2018 at 09:53 AM. 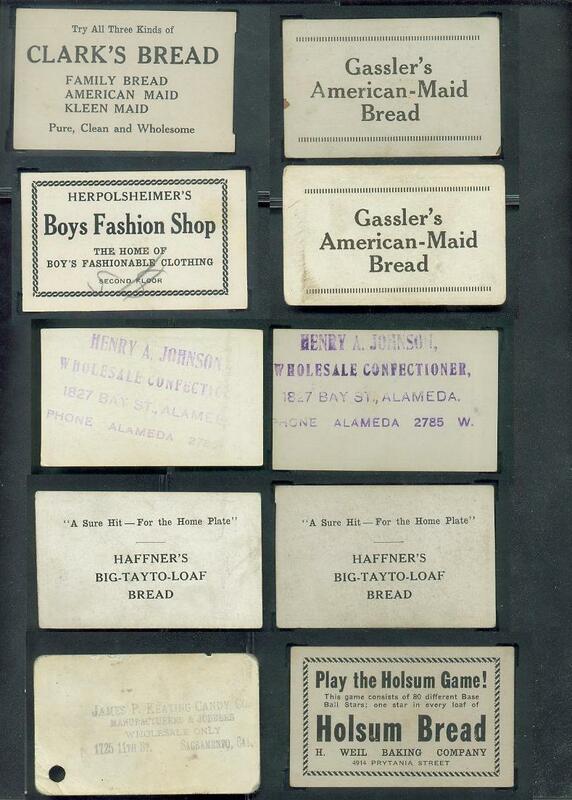 I found 7 of these Clark’s Bread cards in my collection recently. I sent them off to PSA to be graded. My grandma gave me the cards when I was a kid, more than 20 years ago. I have John McGraw, Red Faber, Sam Rice, Duffy Lewis, George Dauss, Charles Deal, and Pep Young. Of the 7 cards, I think the George Dauss is probably in the best shape. Let me know if you are interested. I’ll likely sell some of them when I get them back from PSA. Last edited by MWheeler79; 10-09-2018 at 07:45 PM. Sounds like they are rare and you will do very well if you auction them off. Good luck.